Thanks to kristopher.roy there's finally a working AutoRateAccurate again for MM4. Basically it's the same like 2.5 for now but new features are likely to come in 3.1. We changed the version number because 3.x is for MM4 only while 2.x was for MM3. The first and most important goal is to improve speed and stability. This script rates the songs of your library based on informations like Playcounter, DaysInLibrary, PlayedPerDay, LastPlayed and SkipCounter. This way the rating will also be increased if you listened a song with your portable player like ipod! And it is really easy to use: Normally you only have to enable AutoRateAccurate in the MediaMonkey-Options. This is one of the mainfeatures of AutoRateAccurate. It calibrates automatically the rating-algorithm so that you never get too much high rated or too much low rated songs. In the options you can decide how much percent of your library should have five stars and then automatically the algorithm gets adjusted. AND: If you don't want the script to give some ratings, for example half star, just set that value to 0%. This Autocalibration can be started automatically on startup of MediaMonkey, which is optional but recommended. If this feature is enabled only songs with no ratings get autorated. Songs which you already rated by hand won't get overwritten because they probably are even more accurate than the autoratings. This option is also very useful if you just want to try out AutoRateAccurate - if you don't like it just let it delete the autoratings with "Delete AutoRatings". If there are not enough information (if a song never has been played for example) AutoRateAccurate is not able to calculate a rating. 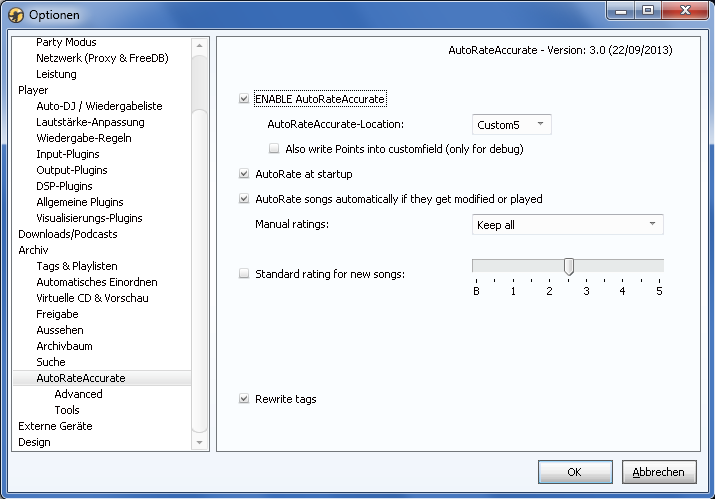 That's why you can set a default rating for all new songs which can't be autorated. -Changed: The script now uses the official SkipCount from MM4. -Removed: SkipDetection as it's already implemented in MM4 by default. -Removed: OptPlaycount to improve stability and performance. -Fixed: Regression in code removal. AutoRateAccurate is completely free. So don't feel obligated to pay something! I'm already pleased by "thank you"-posts in this thread. Although you can surprise me with something from my Amazon wishlist. But please remember that I can't promise to work on the script regularly as I my free time is really limited. how is this thread empty?! edit: oh, and the year is wrong in the thread title. odyss3y wrote: how is this thread empty?! How do I stop a song from getting auto-rated when it's skipped? "By the way although a skip is only counted if at least ten seconds and at most 80% of the song have been played. This values can be changed in the ini-file. I think there's no need for changing this through the optionsheet since the default values work well in most cases." I'd still really like to edit this ini file for how skip time is calculated. AppData\Roaming\MediaMonkey\MediaMonkey.ini as an AutoRateAcc area. I tried changing the 10000000 thinking that was milliseconds, but that didn't seem to do what I wanted after I restarted MM. I cannot seem to find another ini or vbs file where it would make sense trying to edit. there should be an couple arrow buttons to scroll the number of seconds up or down in the options for auto rate, in mmw's main options panel. just looked its mmw 4's program he removed all the stuff i was talking about.. um don't know where in or what ini file for you sorry. Is it possible to get SkipDetection back? MM4 marks a file as skipped only if it's skipped in the interval set from 2 seconds to 3/10 of length of a track. Even more strange is that it only counts if you press the 'Next' button. If you double-click another track after 5 seconds of playback it will not count as a skip - the song gets no rating at all. Also, if you click Next when the song is outside the Skip detection interval (1/2 of the song for example) the song won't get any rating. Finally using this, didn't notice it 9 months ago lol. I know this takes a lot of work and I know you don't spend a lot of time on it, but how about adding support for rating albums as a whole rather than just individual tracks. I haven't done programming in years so when I looked at the code I had a hard time following it. I'm assuming adding album support would be a whole lot harder than just tracks. I have the one for mm3 since I am still using mm3 but I have got an issue with this script now that I can't figure out. No matter how I reset the settings for auto rate I keep getting the same error of.
" Your settings result in to high of a value "
do any of you know what is causing this. ? rovingcowboy wrote: I have the one for mm3 since I am still using mm3 but I have got an issue with this script now that I can't figure out. No matter how I reset the settings for auto rate I keep getting the same error of. I found two sections in the AutoRateAccurate.vbs script where the the phrase "Your AutoRateAccurate-formula results in too high values!" was found, and I deleted those sections and saved the amended vbs; I assume AutoRateAccurate is still working afterwards. Okay thanks I'll have a look at it. But wondering if you just deleted the message part of the script? rovingcowboy wrote: Okay thanks I'll have a look at it. But wondering if you just deleted the message part of the script? and saved the vbs script. yeah i seen that section. but i got to thinking what is the reason he put it in for? does it mess up with higher point numbers? does it make longer point nunber listings in the custom field? does the more point numbers if made. add to the size of the song file? so i left them in until i can figure out what it is there for i am not a good scripter so i don't like to change things much unless i can make for certian that it wont cause trouble farther on. I decided to go ahead and do that but I made back upof his script in case it doesn't work. Thanks again. In case you haven't figured it out already, keep your back-up copy of the vbs in a folder far away scripts\auto folder.